Whether you live in Texas or somewhere else, you’ve been affected by the images and stories coming out of the Houston area in the wake of Hurricane Harvey. Amid the record-breaking rainfall and historic devastation, two things became abundantly clear to the team here at K12 Insight. No. 1: The rescue and recovery efforts in Houston evidenced the tremendous capacity for care and generosity that people are capable of. No. 2: In times of trouble, public school buildings and public school communities are vital hubs of communication, shelter and coordination. As communities in southeast Texas and parts of Louisiana begin the long road to recovery, here’s a quick look at the selfless efforts of friends and neighbors in several local school communities. After calling for donations and volunteers, Katy Independent School District was so overwhelmed by responses that the district had to temporarily suspend donations in an effort to inventory and distribute what they had already received. Community members filled an entire school hallway with donations in just 27 minutes! Organizers converted Klein Oak High School, part of the Klein Independent School District, into a shelter, recovery command center and a nurse’s clinic. The district even converted livestock pens into shelters for family pets. Located 20 miles north of downtown Houston, Spring Independent School District opened its school doors to community members in search of shelter. District students volunteered to help serve food to families affected by the storm. In many cases, district leaders turned to technology to field questions from parents and families and to organize relief efforts. 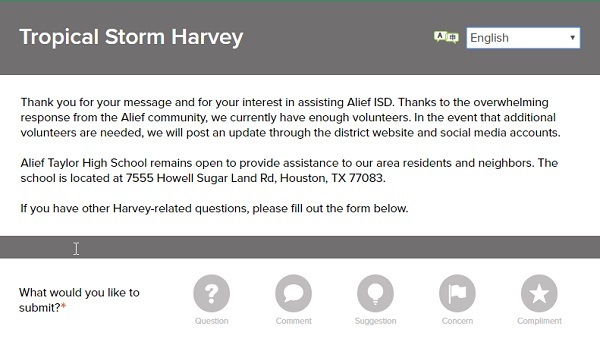 Spring ISD created an area on its homepage where families and staff could request relief from the district’s education fund. Both the Fort Bend Independent School District and the Alief Independent School District used Let’s Talk! to organize volunteer efforts. 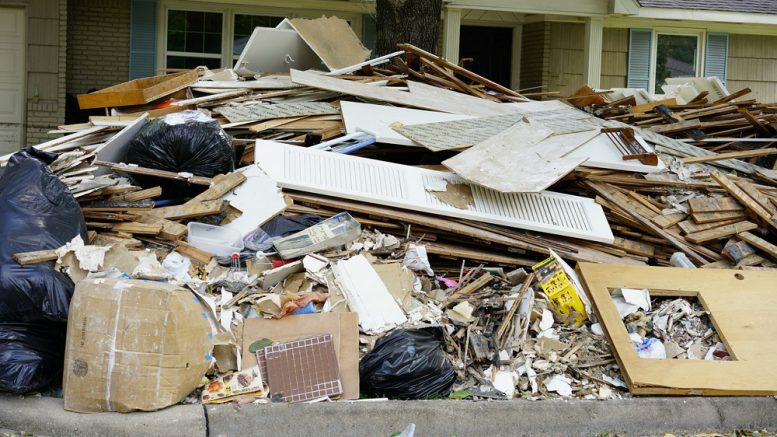 In Fort Bend, administrators received more than 600 online requests in less than 24 hours from staff members who wanted to volunteer. These are just a few of the many stories that have emerged from southeast Texas in the wake of Hurricane Harvey. As the recovery effort kicks into full gear in the coming weeks and months, our thoughts are with all those affected by the storm. Be the first to comment on "Organizing relief in the wake of Hurricane Harvey"